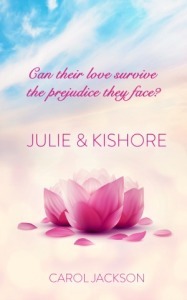 The following is a guest post by Carol Jackson, author of Julie & Kishore and Julie & Kishore – Take Two. If you would like to write a guest post on my blog, please send me an e-mail at contact@cecilesune.com. Julie – a Kiwi girl, a red headed, freckle faced, plain Jane longed to wear a white wedding dress and see her handsome groom waiting for her as she took her walk up the aisle. She was waiting to find her Mr Right – then she met and fell for Kishore, a boy from India who had been in New Zealand for two years. Despite her reservations, she decides to go out with him. In doing this, was she going against all that was deemed acceptable? How would her parents react? If their relationship blossomed would Kishore’s very traditional Indian family accept an English girl into their family? Can their love survive? When I wrote Julie & Kishore, we were living in a semi-rural setting in a delightful suburb called Swanson in Auckland, New Zealand. Our property had 3 1/2 acres of land and my writing desk was positioned to make the most of the view of our beautiful garden, with a big peach tree being the focal point. As the seasons changed I watched the flowers blossom and the fruit ripen. Along with peaches we also had grapes, passionfruit, apples, feijoas, bananas, grapefruit, persimmons and plenty of macadamia nuts – it was heaven! At the time, my husband and I ran our own business and I did some of the office work from home, this thankfully enabled me to also spend time writing. Once I put my mind to the book and began to write, the words (while overlooking that beautiful garden) just seemed to flow from my head to my fingers to the keyboard. All of my memories from the ‘80’s – where the book is set – came flooding back. I wanted to write this story for a very long time and as my children were both at school, once I started, I could not stop! I thought, ate, dreamt and breathed the words. Like most writers, I kept a notebook with me at all times to jot down my thoughts, which I did, even if it was in the middle of the night. 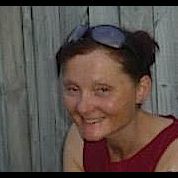 Julie & Kishore is loosely based on my own life, a Kiwi girl who met and fell in love with an Indian guy in the mid-’80’s. We, as a real couple faced some of the same problems as the characters in the book. My husband is an absolute romantic at heart, just like Kishore, so this part was easy to write. Although, in real life we are a bit boring, which is why Julie & Kishore has some adventure and excitement added to it and as such is fiction. While writing – once a week I left my house on foot and walked 20 minutes to the top of my street where I attended a Yoga class. After telling the class members about my writing, I was inspired to give the first printed draft to the Yoga teacher to read. She did and said she loved it as she could relate to many of the true Kiwi references in the story. Many more drafts and fleshing out of the story followed. I have written a sequel called Julie & Kishore – Take Two and am currently writing a third, which has the same characters, but is a different story. The lovely Kitty and the team at GMTA publishing have enabled my dream of getting an e-book and printed book to come true. I am so grateful for the opportunity. I am born, bred and live in Auckland, New Zealand. In real life, just like my books, I am married to an Indian man. My husband and I have been together for more than twenty years. Friends and family urged me to write a book about us, finally I found the time. Julie & Kishore is loosely based on my life, although I have changed too much of the content to call it non-fiction. I have written two books, Julie & Kishore and the sequel, Julie & Kishore – Take Two. I am currently writing a third, Nina’s Art, which involves many of the same characters, but is a different story.